Lettuce is an annual or biennial plant that can be eaten raw or cooked. Some lettuce varieties form heads, while others grow as single leaves. 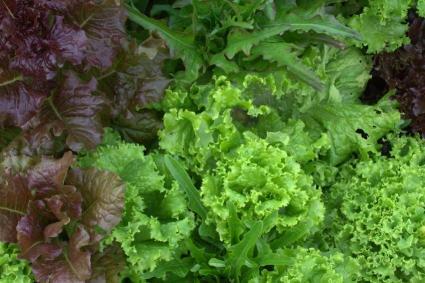 Looseleaf lettuce is easy for home gardeners, and many cultivars are available. Bibb lettuce, also called Boston or Butterhead lettuce, forms very loose heads and can also be grown in the home garden. Iceberg lettuce, the most commonly sold type in the United States, forms crisp, tight heads. It was named that because it transported during the 1920s in train cars buried in crushed ice, making the cars look like icebergs. Romaine is also a head-forming type, as is Batavian. 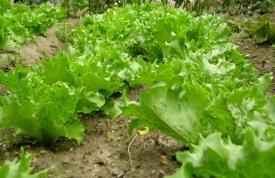 Head-forming lettuce is difficult for home gardeners to grow. Modern lettuce is descended from Lactuca serriola, which still grows wild in Europe and parts of Asia. It contains a narcotic substance similar to opium, lactucarium. The ancient Egyptians used it as a hypnotic and a sleep aid. The Greeks considered it an appetite stimulant as well as a sleep aid, and were divided in opinion on whether it should be eaten at the beginning or end of meals. The physician Galen recommended eating the plant to promote restful sleep. Lettuce is a cool-weather crop. In hot climates, they cannot be grown in the summer. Heat makes the plants bolt - send up a tall stalk with small leaves and a seed head at the top. Bolted lettuce has a bitter taste. Head-forming lettuce will bolt with even brief exposure to heat. Iceberg lettuce bolts if the temperatures are over 70 degrees for a few days. Lettuce doesn't need full sun, and growing it in shade gives it some protection from the heat. Many gardeners plant it between slow-maturing crops like cabbage or peppers and harvest it before the slower crops need the space. It thrives in the shade cast by corn, pole beans, staked tomatoes, or other tall crops. Even moisture is very important for lettuce, since the roots are shallow and dry out quickly. Mulching helps retain moisture. Avoid overhead watering; wet leaves are vulnerable to mildew and leaf rot. Soak the soil instead. 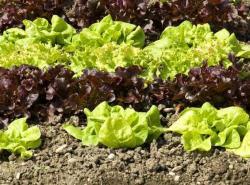 Lettuce needs a rich soil, with a high nitrogen level to promote leaf growth. Soil should have a light, moisture-retentive texture. The ideal pH is between 6.0 and 7.0. For very early crops, you can start lettuce seeds indoors. Sow seed eight weeks before the last expected frost date. Keep the flats below 70 degrees and evenly moist. When the plants are three or four inches tall, harden them off for a few days and set them out in the garden. Space them about a foot apart, depending on the variety. Sow lettuce seeds in the garden as soon as the soil can be worked. They can be sown in rows or blocks, but try to distribute seed as thinly as possible. Mixing the tiny lettuce seeds with a little sand or buying pelleted seed makes this easier. Wet the soil thoroughly. Scatter the seed, and cover it with a fine sprinkling of soil. Keep the seedbed moist. Top-dressing with a nitrogen-rich fertilizer like blood meal, cottonseed meal, or a fish emulsion helps to sustain the fast, steady growth that lettuce needs. Manure tea is also good. Many gardeners screen lettuce with netting, cheesecloth, or lath stretched across frames to protect it from summer heat. Loose-leaf lettuce must be thinned regularly. Use the thinnings in salads. Lettuces are harvested in different ways, depending on the type. Pick individual leaves of looseleaf lettuce. You can pick the outer leaves of Butterheads while leaving the inner leaves to grow, or you can cut off the entire head about an inch above the soil and let the a new head grow from the root. Heading lettuce is usually pulled up whole, but the outer leaves can be picked separately. Few pests bother lettuce, although cutworms and slugs can be annoying. Leaf rot is caused by several kinds of soil-borne fungi. Mulching, rotating crops, and clearing away all degree promptly are preventative measures. So-called 'tip burn' is a normal result of hot weather and can be minimized by providing moisture and shade.